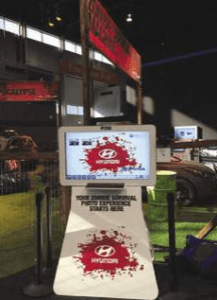 Hyundai used TapSnap at an auto-show to create an undead-themed photo entertainment experience that drew visitors to their display. Trade shows are all about the experience. A lively trade show often has music, art installations, a mascot or two, and lots of vibrant, interactive booths. At the end of the day, you want trade show visitors to remember your booth, and more importantly, to engage with your product. A successful trade show will generate a substantial amount of leads, which in turn creates measurable ROI. So, what’s an effective way to attract visitors to your booth? Adding a photo booth to your trade show display! Here are 4 ways a TapSnap photo booth can generate buzz for your brand and how it can transform any exhibitor space from boring to brilliant. People love taking pictures. People especially love taking pictures of themselves. Having a photo booth as a centerpiece creates immediate interest, and visitors will gravitate towards your booth looking for a fun, memorable souvenir. The photo booth is naturally a group experience, so you'll have people coming in droves with their friends and co-workers. As visitors wait in line to get their picture taken, use this opportunity to promote your services and get to know your audience. Exchange business cards, shake hands, and ask people questions. The photo booth line creates a perfect opportunity to network. After someone takes a photo with a photo booth, that's not the end of the story. Photo booth companies have the ability to create custom backgrounds and custom prints. To create a modern, lasting impression, develop a social media campaign surrounding your trade show stand's photo booth pictures. Include features such as a Facebook link, Twitter handle, and Twitter hashtag on the photo booth background and printed pictures. Photo booth users will have a souvenir that conveniently promotes your social media pages. Furthermore, people are likely to share their pictures on their own social media pages which allows your brand to reach audiences beyond the trade show. In addition to your social media page links, you can include a promo code on the photo that people can use for your service. The promo code could be for a free trial, a discount, or a raffle contest. This simple marketing tactic may convert visitors to use your products or services. Trade shows are busy, and oftentimes sitting down for a break is a luxury. A photo booth is a wonderful centerpiece for a visitor's lounge because it allows people to kick back, relax, and take snapshots with their friends. Trade show goers will associate the photo booth with a positive, fun experience, and hopefully spur them to come back next year. After a busy day of setting up, networking, selling, promoting, and finally cleaning up, you'll want to trust that your trade show booth made a lasting impression. Luckily, a photo booth allows for impact even after the show is over. In addition to photo booth users sharing pictures via social media, you can drive trade show visitors back to your website by creating a landing page for all the pictures taken that day. Visitors can scroll through the hundreds of pictures taken and enjoy seeing who else got to take some goofy, fun snapshots. A digital photo kiosk can also capture email addresses to create an email marketing list. With a photo booth, you make your visitors the stars of the show, while simultaneously creating hype surrounding your brand. A photo booth will always create a lasting, positive impression.